Beth Paul is going to show us how to make several different kinds of cards. To make these cards, we will be using the the basic tools we all have: scissors, xacto knife and cutting surface, bone folder, pencil, ruler, glue. If you have it, bring it. If not, you can still follow along and learn with us. Paper/cardstock will be provided. Join us for a busy day making unique one-of-a-kind cards! One of the topics our members wanted for programs is lettering on items. Last program we lettered on Christmas ornaments. For November’s program you will each be given a piece of canvas, provided by Eleanor Russell, to letter on. You can try all of these different tools and have your own sample to keep to remind you of what you liked best. If you have some other fabrics you want to try, please bring them. I will have paint, acrylic inks, all types of markers, etc. If you have something you want to try on it as well bring it along. The photo on the right has panels that were painted with acrylic ink on bleached muslin and lettered on. I will have a handout on helpful tips. Photos kindly provided by Sheryl Bracey. In order for us to get an early start on Christmas, Carol Savage and I will be showing you different mediums to use on Christmas ornaments. We will demo on the camera and there will be time for you to try it for yourself. We will have supplies available for your use. The pictures shown are just a sampling. I use them for my package tags, place cards, gift items, etc. Come and join in on the fun! Also, in honor of Ampersand Day, bring a sample of your favorite ampersand to display, along with our envelopes. Vicki Brandt has lettered a page of ampersands that will be given to all attending. JoAnn Bates will show some cute and easy ways to doodle your way towards the “wow” envelope. Maxine Gaither will demonstrate how to make a card and envelope from one piece of paper, and many more creative ideas. Rose Wathen will present pointed brush ideas that will make your lettering pop, and things to draw with the brush. Sheryl Bracey will show clever tools to add to your arsenal of wow-popping add ons…from pearls to glitter! I will have years of envelopes that I have received for you to drool over. Aren’t I a lucky girl? We will have a great time! 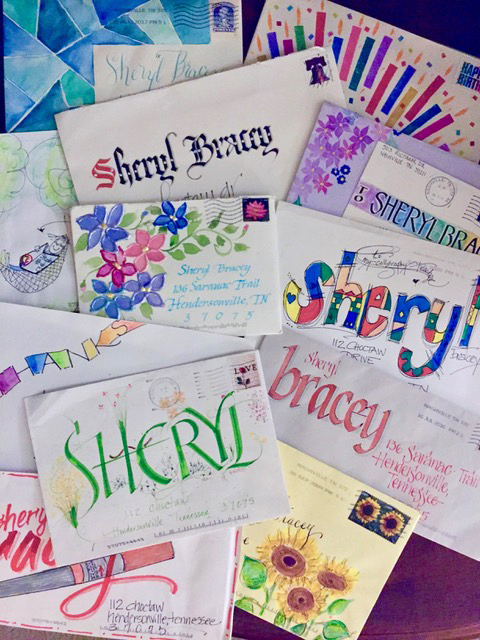 Envelopes by JoAnn Bates, Vicki Brandt, Linda Floyd, Mary Henderson, Kristina Howard, Carol Percy, Ron Ross and Rose Wathen. Photo kindly provided by Sheryl Bracey. After seeing that the St. John’s Bible had numerous hand cut rubber stamps in it I remembered a time when Alice Fuqua taught a class in that for our guild. It’s probably been 25 or 30 years ago. I have asked her to come and do a repeat performance of that class. She has refined that skill to a fine science. This skill has come in handy many times for me while decorating envelopes. I know you will enjoy this fun program. I will be bringing all of the items except for the x-acto knives and I ask that you bring one of those. John Neal, from John Neal Bookseller, has offered to send our guild 30 copies of these two Bound and Lettered magazines. Both contain articles about Rainbow Writing. Depending upon the number attending in September you will take home one or both of these magazines. He is also offering a special deal for those who have never taken or has let their subscription lapse. You can get the four Volumes of #15 for $15. It is usually $26 for the four volumes. You can subscribe at the meeting; I will have subscription forms. (I had asked permission to copy one of the articles and he offered actual magazines and a great subscription rate instead!!) Since many of you wanted this program I hope you will enjoy it!! Envelope book photo kindly provided by Carol Percy. Come Make an Envelope Book & Learn About Hashtagging! Due to unfortunate circumstances, our March book-making had to be postponed until May. Big thanks to Rose Wathen for stepping in with a program for everyone to enjoy on lettering! This is the easiest book you will ever make! It requires no sewing, cutting, or glueing! At our May meeting, everyone will get to make a small book out of envelopes. It can be used as a sampler, a mini journal or a gift for a friend. Four envelopes will be provided, but these books are so easy to make, you might want to bring some of your own envelopes to make another one! All of the envelopes must be the same size but can be different colors. You might also want to bring embellishments such as tiny envelopes, Washi tape, rubber stamps, and scrapbook type patterned papers. These will enhance your book but can be added at any time with a glue stick or glue dots. If you wish to decorate your book, it would help if you bring scissors and glue. As an added bonus, Miranda Fuller will demonstrate how to post photos of your books or other work to social media using the hashtag #nashvillecalligraphersguild. To learn more about hashtags, please see her entry in the May newsletter or visit our blog. Our program for November will offer a great recap for new members and a walk through the past for veterans. To celebrate our 35th anniversary, Carol Ann Baily gathered photos and put together a slide show that spans the history of the guild and Ann Cobb made a comprehensive booklet of our officers, workshops, meeting places, logos, etc. It was decided by the group that these would be nice to share at our meeting for those who could not attend the celebration in September. In addition, our guild had the distinct honor of assisting with the hosting of international calligrapher Donald Jackson’s visit to Carson Newman College in October, where pages of the commissioned St. John’s Bible were on display. Members who were in attendance will share their weekend experience with Donald Jackson, who headed the project and worked with a select team of lettering artists to render the Bible in a beautifully modern calligraphic hand, complete with beautiful illustrations. We will not be meeting at Plaza. Please see your Summer newsletter for the location. Our next Guild meeting will be on Saturday, November 14, 2015, at Plaza Artist Materials in Nashville. Please join us immediately following the meeting as Zentangle instructor Lynn Noga presents Peek-A-Boo Zentangle cards. These cards can be used for any occasion but Lynn will be focusing on styles for the upcoming holidays. Please feel free to bring any micron pens you have. It should be great fun!